What to pack for a ski trip? Stunning natural scenery and the thrill of speed - a combination which makes skiing a very fun and unparalleled sport. It is never too late to learn to ski although it is best to learn skiing while you are young (simply because the learning curve will be less). There are a few indoor skiing slopes in the UK where beginners can pick up the techniques required before they head to the mountains to ski in the dramatic scenery. So, once you have had the basic training and are ready to head on your ski holiday, it is the time to decide what needs to go into your ski holiday kit. In addition to your ski equipment (skis, ski poles and ski boots etc - which you can hire in most places), you will need to pack the following clothing/accessories for your ski holiday. One of the most important pieces in your ski kit will be your ski jacket. You will need a jacket that will not only protect you from the elements but also let you ski comfortably on the mountain slopes. The jacket will need to be water-resistant, windproof and breathable. 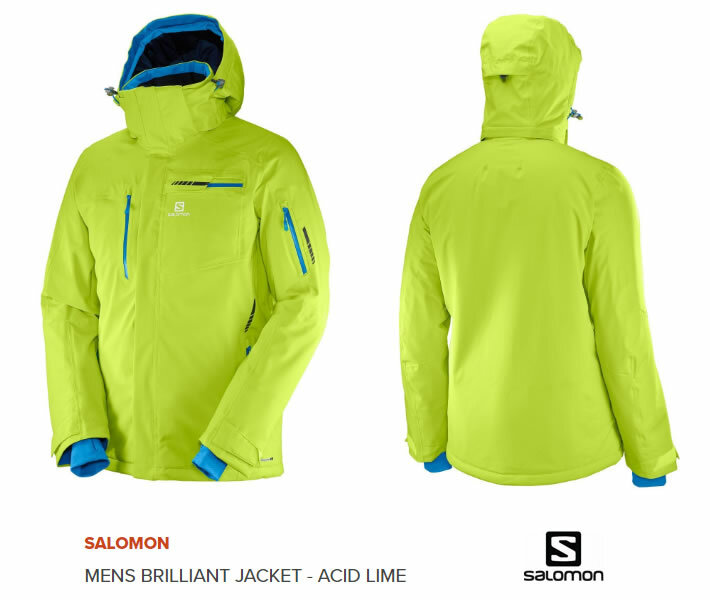 A good example is the Salomon men's jacket featured below. It is waterproof, and has a 4-way stretch fabric that is ideal for keeping out the snow while still allowing easy movement. Other features of the jacket include a removable hood with 3D adjustment, powder skirt, efficient moisture wicking 3D stretch lining, cuff adjustment, goggle wipe and a body air vent system with mesh backing. The jacket is available from Simply Hike for £160.00. Ski gloves come in a range of styles and designs - traditional gloves, soft shell gloves, wrist warmers and lined gloves to name a few. Some people prefer mittens over gloves but I feel that the design of the mittens lends to lack of mobility compared to gloves where each finger has its own compartment. But whether you go with mittens or gloves, ensure that it is made of waterproof and breathable fabrics and is properly insulated so that it provides warmth and breathability without restricting movement. Size and fit are very important. The gloves/mittens should fit snugly while allowing enough room at the finger tips. When making a fist, it should be comfortable enough to allow you to bend your fingers easily. Another important part of your skiing kit. You need to have a couple of good quality thermals and mid layers to keep yourself warm and comfortable even on the coldest of days. One of the important features for any thermal is to have good wicking properties to keep the sweat away. Most modern thermal wear are either synthetic based or made with fine-grade merino wool. Mid layers are equally important in the while insulation system / layering system. They provide a space between your thermal and outer shell/jacket to trap and conserve your body heat. Again they come in synthetic or merino wool or a combination of both. Be sure to pick one that offers the best level of warmth and breathability ensuring comfort while skiing. Ski pants come in a number of styles - you have slim fit designs, comfortable fits, softshell pants, insulated or non-insulated pants and so many more styles. Whatever style you pick ensure that the pants are windproof and waterproof, as well as stretchy for a comfortable fit. Most ski pants come with features like reinforced scuff guards, articulated knees and side zippered vents etc. However, just wearing your snow pants will not protect you from the cold especially of you are hitting the slopes in the colder months. You will need base layers / thermal pants to keep you warm. Thermal ski pants just like your thermal base layer (top) need to have moisture-wicking and breathability qualities. Ski socks are not just extra thick socks! A good pair of ski socks will not only provide warmth but also extra cushioning enhancing your experience on the ski slope. The best ski socks nowadays are made from a combination of organic fibers (for e.g. Merino Wool) and synthetic fibers (for e.g. Nylon). Pick socks that have moisture wicking properties to not only keep sweat away but also to prevent odours. Some brands even offer battery heated ski socks! Another important part of your ski kit would be the helmet. You must be aware of the importance of wearing a helmet while riding a motorbike or bicycle, the same principle applies to wearing a helmet while skiing. A good helmet not only reduces the severity of head injury (should you be involved in an accident) but it also offers others benefits like keeping your head warm, blocking the sun's rays from you eyes, holding your goggles in places etc. So, invest in a good helmet. Simply Hike have a great range of quality ski helmets from a number of well-known ski wear brands such as Bolle, Giro and Anon. Ski googles are not just about style, they make it easier to see better in the snow surroundings. Some goggles offer better peripheral vision while most ramp up the contrast and definition allowing you to see better. While choosing the ski googles look at factors like its compatibility with your helmet, the lens shape and colour, the googles UV and anti-fog protection features as well as if it has vents on the frame to help with air flow. So, that's my packing list (clothes/accessories only) for a ski holiday. What else do you think I should include in the list? Let me know via the comments section below. Post in collaboration with Simply Hike. As always, all opinions are solely my own.